Please add your first, last name and contact number. We will contact you within 24 hours to address any concerns you may have. Families and individuals are welcomed to our newly renovated apartment, with 2 private bedrooms which sleep 5 People. The bathroom and kitchen are brand new. It's a bright, comfortable and totally private space in a two family apartment(Brownstone). Walking distance to LIRR(Saint Albans Station), restaurants, and Roy Wilkins Park. Close to Belmont and Aqueduct racetracks as well Rancino Casino. We are perfect for the ones in transit. Families and Individuals are welcomed. Our cozy comfortable apartment is 10 minutes from JFK airport in NYC, close to Belmont and Aqueduct racetracks as well Rancino Casino. We are perfect for the ones in transit. Our newly renovated apartment, with 2 private bedrooms which sleep 5 People. The bathroom and kitchen are brand new. It's a bright, comfortable and totally private space in a two family apartment(Brownstone). Walking distance to LIRR(Saint Albans Station), restaurants, and Roy Wilkins Park. Families and individuals are welcomed to our newly renovated apartment, with 2 private bedrooms which sleep 5 People. The bathroom and kitchen are brand new. It's a bright, comfortable and totally private space in a two family apartment(Brownstone). 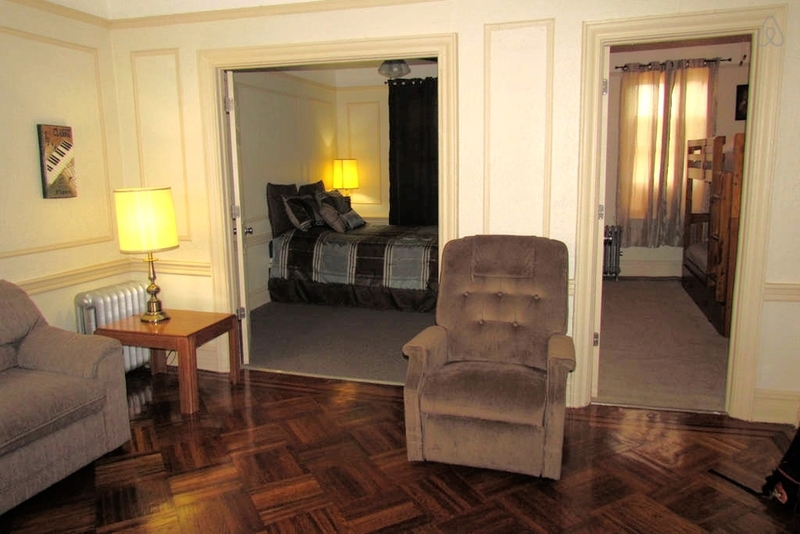 Walking distance to LIRR(Saint Albans Station), restaurants, and Roy Wilkins Park. - Bedroom #1 (sleeps 2) - Comfortable, bright bedroom with 2 windows, Queen size bed with air conditioner in the summer. -Bedroom #2 - (sleeps 3) cozy bedroom with twin trundle bunk bed with air conditioner in the summer. Other times can be arranged, please ask. PLEASE SEND ME AN INTRODUCTION EMAIL, A BIT ABOUT YOUR TRIP AND DATES BEFORE TRYING TO BOOK. I WILL RESPOND RIGHT AWAY. Your Home Away From Home, Stay With Us.